Hi, guys. Do you remember The Bard's Tale, the epic 1985 role-playing game by Michael Cranford? You should! In any case, perhaps this video will show you why you should care about this classic. The 2010.1 versions of Cloanto's Amiga Forever and C64 Forever available now! 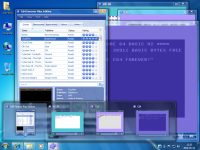 Amiga Forever DesktopCloanto has released the latest versions of their popular and easy-to-use Amiga Forever and C64 Forever emulators. This is great news for old and new fans of the greatest Commodore platforms, including all versions of the Amiga series (inclusive of the CDTV and CD32), and most of the 8-bit line, including PET, VIC 20, C-64/128, and C-16/Plus4. I hope to post full reviews of both of Cloanto's new releases soon. Welcome to the weekend with Matt Chat 5, covering another of the all-time greatest retrogaming classics. This week I look at Acornsoft's Elite, the pioneering space-trading game that made such a huge impact in the mid 1980s on the BBC Micro and other platforms. Commodore 64 obsolete in 2008? Yeah, right! "The current state of computing is crazy. Any time you buy a system it is already outdated. Back in the days of the Commodore you really didn't have to worry about that because the C64 was what it was -- other than expansion devices." You tell'em, Daniel. We've talked incessantly here about the benefits of giving the software a little more time to catch up to the hardware. The article outlines several uses for a Commodore 64 (past and present), which range from music machine to emergency response. Definitely a fun an engaging read for anyone who loves the C-64.